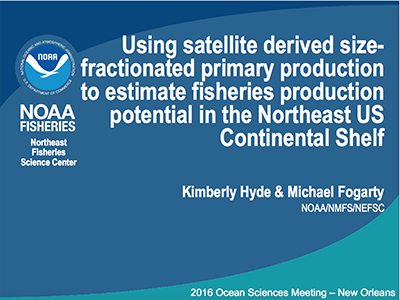 Description: Advances in satellite derived phytoplankton size class and functional type models have broadened the fisheries application possibilities of ocean color remote sensing. Here we partition phytoplankton biomass and primary production into microplankton and nano-picoplankton size classes for use in a bottom-up approach to estimate fisheries production and exploitation rate potentials. In this simplified food web model approach, direct grazing by mesozooplankton on larger phytoplankton and transfer of nano-picoplankton production through the microbial food web are the two pathways in which primary production is transferred to secondary producers. The fractions of phytoplankton production are then traced through a simplified food web to determine the production potential at multiple trophic levels. In the Northeast US Continental Shelf (NES), total primary production ranges from 200-300 gC m-2 yr-1, which yields on the order of 825,000 tons of annual harvestable production for the entire ecosystem. While the fraction of nano-picoplankton production in the NES is often greater than 75%, inefficiencies in the transfer of carbon through the microbial food web result in a small fraction of this production being available at harvestable trophic levels. Accordingly, the primary production derived from microplankton, 20-30%, ultimately controls fish and shellfish production and sets constraints on the amount of production available to be extracted from the ecosystem at sustainable levels. By gaining a better understanding of the phytoplankton community composition and associated primary production, we can better predict the overall production of the ecosystem and subsequently, sustainable harvest levels.